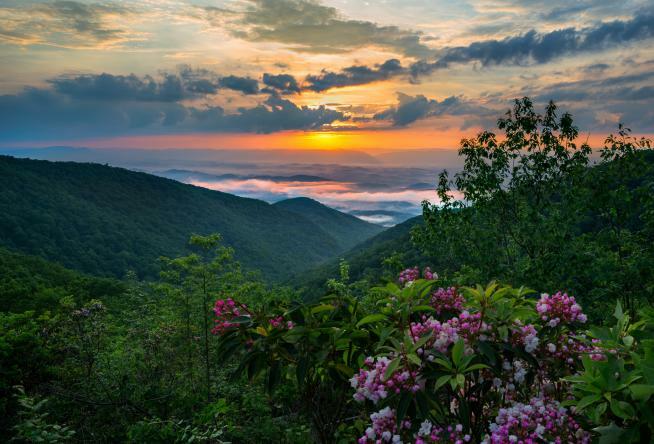 Sunsets are glorious in Virginia’s Blue Ridge and finding the perfect perch to enjoy one is essential. Settle in at one of these 14 locations to reflect, spend time with someone you love, or just soak it in. 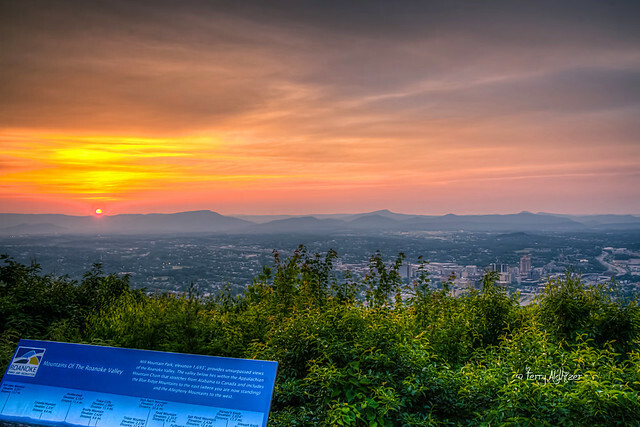 Home of the iconic Roanoke Star, Mill Mountain is an ideal place close to the city to witness a breathtaking sunset. Situate yourself at the base of the star or find a look-out from one of the trails. 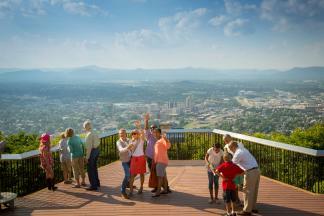 Evenings on Mill Mountain tend to create lasting memories. Once believed to be Virginia’s highest peak, Sharp Top Mountain is one of the Peaks of Otter on the Blue Ridge Parkway, and offers incredible 360-degree views. A shuttle will have you to the top in no time, or you can choose to hike it. A fairly easy four-mile loop off the Blue Ridge Parkway on Roanoke Mountain yields nice views of the valley below. It&apos;s a unique spot in that the loop includes both east and west facing overlooks, making it one of the few spots in Virginia&apos;s Blue Ridge where you could see both the sunrise and the sunset! Arrive in time for dinner at Ballast Point, but then order a flight or your favorite Ballast Point craft beer to enjoy sunset on their patio overlooking the lake. The views here rival those of anywhere else in Virginia’s Blue Ridge. At more than 2300’, Iron Mine Hollow (pictured at the top of this post) is on the Blue Ridge Parkway at MP 96.2. It’s an easy sunset spot, as it’s just a pull-off along the road. Park your car, get comfy on the hood, and enjoy the show with your sweetie. This overlook at MP 91.8 on the Blue Ridge Parkway serves up a gorgeous view of Purgatory Mountain and the James River. It’s an excellent option for those in the Buchanan area to make the short drive up to the Parkway to take in an incredible sunset. Hop out and stretch your legs for a few minutes as you make your way to the stone observation deck at Thunder Ridge Overlook, MP 74.7 on the Blue Ridge Parkway near Natural Bridge. Rent a boat or hop aboard the Virginia Dare for a sunset experience on Smith Mountain Lake. A vast body of water, the lake will shimmer for what seems like miles as the sun goes down. When the sun sets on the water, it’s almost a two-for-one deal. The calm of the reservoir at Carvins Cove is the perfect placid reflection of all the shades of orange, red, purple, and orange that sunset produces. At milepost 99.6 on the Blue Ridge Parkway, Great Valley Overlook provides a view of just that: the Great Valley of Virginia, also known as the Shenandoah Valley. The elevation at the overlook is almost 2500’, which means you’ll get an awesome view of the valley with your special sunset. Hike Tinker Trail to perch upon Hay Rock, the premier Carvins Cove overlook. The trail is about eight miles round trip, so bring a flashlight and a friend for a safe journey back. Part of the trick to catching a great sunset is to situate yourself in a place that is serene and scenic. Our Roanoke River Greenway is just that. 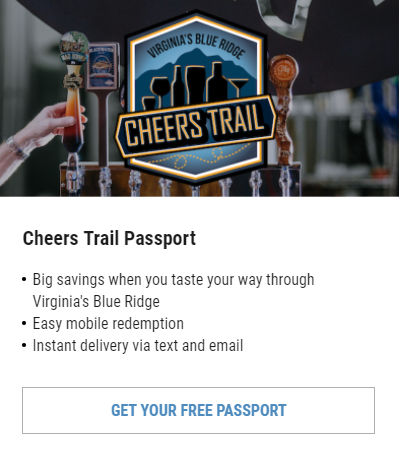 Whether you’re walking along our trail or have spread a blanket for an evening picnic, the Greenway is a fantastic in-Roanoke option that feels a world away. The two-mile Read Mountain Trail through Read Mountain Preserve leads to Buzzard’s Rock, a great look-out for a stunning sunset. When all the overlooks are full for sunset watchers like yourself, just drive. There’s not a more beautiful drive than America’s Favorite, the Blue Ridge Parkway. The sun sets in the west; look that way. Photographers master the capture, but the rest of us should put the camera or phone down and just live in the moment. Bring a flashlight with you. Dark comes as the sun sets.